Jessica Rabbit has earned a few of her own merit badges, and you can have your own with Jessica featured on it. 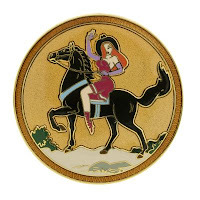 This circular pin has clear fill background elements and shows Jessica riding a black horse. She's wearing a black cowboy hat, maroon boots, and has a short skirt with a white stripe at the hem.